Because of his strong involvement in the world of the motorcycle and his extensive experience, Motul has become a trademark that guarantees quality, with a know-how recognized by all motorcycle enthusiasts. It has been proven that meticulous maintenance and care of the motorcycle provides better protection and longer life. Every part of the motorcycle needs its own specific and adapted maintenance. 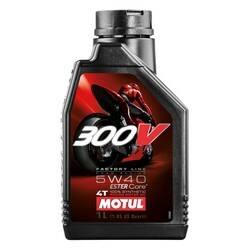 The products of the Motul MC Care series were developed specifically to meet all the needs of the motorcyclist. They give the possibility to take care of both the motorcycle and the motorcyclist and his equipment. • Double ester technology developed for the best factory teams. • Reduces friction for more power. • Optimum resistance to high temperatures to protect the engine and gearbox. • Perfect operation of the wet clutch.